From Maine to Kentucky: Y-DNA Test Results ~ A Non-Paternity Event? Y-DNA refers to the DNA found on the Y chromosome, which is found only in men (passed from father to son to son, etc.). Testing of Y-DNA can reveal ancient origins (described as a haplogroup) as well as connecting cousins with the same surname in a family where surnames are passed down from father to son. My dad received his Y-DNA from his father and passed his Y-DNA to his four sons. Since Dad died 21 years ago, I asked one of my brothers (thank you, R) to swab his cheek for a Y-DNA test with FamilyTreeDNA, which he did last fall. FamilyTreeDNA offers the opportunity to join surname projects, and I joined the Pyle surname project on behalf of my brother. I thought it might be interesting and fun to see if I could connect with Pyle cousins. For an understandable explanation of DNA testing, see Beginner's Guide to Genetic Genealogy at Wheaton Surname Resources website and for more specifics on Y-DNA testing, see Beginner's Guide to Genetic Genealogy, Lesson 3. 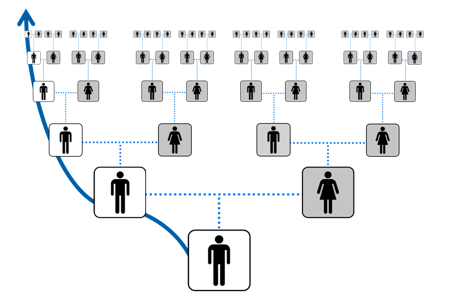 And for an explanation of haplogroups, see Beginner's Guide to Genetic Genealogy, Lesson 4. R1 is the most common European haplogroup, and is found in men in England, Scotland, Ireland, as well as in many western European countries. However, imagine my surprise when I took a look at the Pyle Surname Project and saw that the Pyles who descend from immigrant ancestor Robert Pyle (1660-1729/30), son of Nicholas Pyle of Wiltshire, England, are in Haplogroup I1, a haplogroup found mostly in northwestern Europe (which includes England). People with different haplogroups are not related. Somewhere along my paternal line, there is what is known as a non-paternity event. A non-paternity event can include what you're probably thinking (somewhere along the ancestral line, a mother "fooled around" but her husband's Pyle surname was given to the son). However, a non-paternity event could include an adoption that we don't know about or some other situation where a child was taken into a Pyle household and given that surname. It's also not helpful that there are no other men who match very closely to my brother's Y-DNA at FamilyTreeDNA.com, though I remain hopeful that others will test and show a match. I would love to find other direct male descendants of my third great-grandfather, Stephen Pyle (1762-1840) to test. Following is a chart I created to show his male descendants. I believe I have listed all the male descendants of James Pyle (1823-1900), who was born in Nova Scotia. Where a line "ends" means that there were no male descendants. I would love to connect with direct male descendants of Pyles in Guysborough County, Nova Scotia, and have them take a Y-DNA test! My presumed line, which is not genetically possible, based on the results of the Y-DNA test: Nicholas Pyle > Robert Pyle (1660-1729/30) > John Pyle (1687-1752) > Stephen Pyle (1730-bef 1789) > Stephen Pyle (1762-1840) > James Pyle (1823-1900) > James Tolman Pyle (1855-1912) > Charles McAlpin Pyle (1893-1966) > Charles McAlpin Pyle, Jr. (1924-1993) > my brother. September 2015 Update: See DNA - Narrowing Down the Non-Paternal Event. Jana, thank you for including it in your Follow Friday Fab Finds. Now let's hope a distant Pyle cousin contacts me and will take a Y-DNA test!